The Singapore Grand Prix certainly threw up plenty of surprises with unexpected retirements, feisty fighting talk from Max Verstappen, and a spectator getting a little too close to the action. With Sebastian Vettel winning and Lewis Hamilton retiring, there could be a few more twists and turns in the title race to come. That's all from us but there is not long to wait for the next race, with our coverage of the Japanese GP beginning with practice on Friday at the delightful hour of 01:00 BST. Join us then! Ferrari boss Maurizio Arrivabene set a target of three race wins this season, and that has now been achieved thanks to Sebastian Vettel. It is a moment to celebrate for Arrivabene, but he also may be regretting a few words he said in pre-season. When asked what he would do if Ferrari won four races this year, he quipped: "I will run without shoes to the Maranello hills." OK. Well it is almost time for us to wrap things up. If you haven't read it already, you can read Andrew Benson's race report here. Meanwhile, Singapore Grand Prix highlights will be on BBC One and online at 17:00 BST. Not long to wait! Toro Rosso team principal Franz Tost says that Max Verstappen was correct to refuse the order given to him by the team. He told Sky Sports: "Carlos had newer tyres so we thought we could swap positions. "But Max was right because Carlos was not closing up. Carlos was always four or five-tenths back. If he wants to swap positions, he needs to be closer." "Let the guy on newer tyre have shot," he said. "I wanted that shot and he never gave it to me. "It is not an issue for me." Right, so let's hear some more from Toro Rosso about Max Verstappen's refusal to let team-mate Carlos Sainz pass him in the closing stages. The teenager had been ordered to let Sainz go by his team so the Spaniard could attack Force India's Sergio Perez. He told Sky Sports: "The whole race I had good pace so for me there was no reason to let him past. "If it was the other way round, I think he would do the same thing." There is a small positive of closing gap but it has been a disappointing weekend. It was the toughest race of the year. Is Mercedes' vice-like grip on Formula 1 loosening? There has been no Mercedes on the podium in two of the last four races. Mercedes F1 team boss Toto Wolff has described this weekend in Singapore as "character building" and one that will make them "strong". Ferrari, though, will have seen a chink in their armour. Andrew Yee: Good drive by Verstappen but ignored team orders to let team-mate past. He is a teenager so could he be grounded?? Danny Janssen: Weren't team orders supposed to be banned? Would have been ridiculous if he would have obeyed, he deserved the position he finished at. Carlos Sainz added that he “did not want any polemics” to follow on from the incident, while Max Verstappen said he did not let Sainz past because it had not been explained to him why he should do so. Toro Rosso's Carlos Sainz has just been speaking to BBC Sport's Lee McKenzie about Max Vertspappen's refusal to let him past in the closing stages, as he had been ordered to by the team. Sainz wanted to overtake Verstappen so he could attack Force India's Sergio Perez. Sainz said: "I felt I could get past the Force India but it's his choice.I was feeling very confident that I could do it but he decided not to. I am still wanting the team to do the best they can. "This year I have let him by three or four times. He was told to let me by four times and didn't. It's a bit of a pain." I'm intrigued to see what the fallout will be from Max Verstappen appearing to not obey team orders. What are your thoughts? Let us know via #bbcf1. A milestone for Sebastian Vettel as he equals Michael Schumacher's record of three wins in his first season at Ferrari. With six races remaining, you would not bet against him adding to that before the end of the year. Samantha Joyce: What a shirt EJ! I have missed the crazy shirts. Adam: Wow EJ you've excelled yourself today. Mikeado: Did your wife buy you that jacket, Eddie? Simply outstanding attire, EJ. Love it. The party on Sunday night. We will have some drinks, definitely. My drink bottle failed halfway through the race so I am quite thirsty. If we have more weekends like this, yes we can catch Mercedes. Massive attack. Maybe we can make the impossible possible - we will definitely go for it. We hope this is a sign of the future. Saturday I struggled for whatever reason, I was surprised to finish third in qualifying and today was a struggle again and I had no chance to do anything about first or second. Seb experimented a bit today - at the start of the race he just went. If there was no safety car we could have been close for the undercut but the two safety cars came at pretty crucial times. It was really good to back up qualifying. We matched Seb in race pace and we have got to be pretty happy. "It must be one of my best races. It was pretty intense. Lots of pressure form behind, Daniel had a very good race looking after his tyres. Second stint I was dictating the pace. From then, I was trying to control the gap. We had a really great weekend." Eddie Jordan is the man to conduct the podium interviews and he is sporting a fantastic pink-red coat-type thing. Great scenes. You simply cannot bet against Sebastian Vettel in Singapore. He loves it at the Marina Bay circuit. This win was his fourth there, meaning he has won half of the total Singapore GPs. But will all be harmonious in the team garage after Verstappen refused to let Sainz pass? It is a massive party atmosphere in Singapore as the top three walk out to the podium. Sebastian Vettel points both his index fingers to the sky in celebration as the crowds cheer. Rachel T: Max responded in exactly the same tone of voice as my kids do when I ask them to get ready for school. Dread Pirate Roberts: Verstappen is a spoilt little boy, nothing more. He lacks the maturity required to be a decent driver. Amy Beanie: Vettel is best. That is all. Not a good day at all for Lewis Hamilton, but his advantage over Nico Rosberg is still big heading into the final six races of the season. He heads the drivers' championship by 41 points. "The other Ferrari wins this year have been slightly more fortunate - this was a dominant display." Vettel is now just eight points behind Nico Rosberg in the drivers' championship. "To get both cars to a podium finish is quite an achievement for Ferrari." Wondering what Max Verstappen did, or didn't do? Well, he didn't give up his position to Carlos Sainz, finishing eighth with Sainz ninth. Ferrari engineer: "Yes, you did it! You did it! Pole position and first position from lap one! Magic!" Vettel: "Grazi, grazi! Forza Ferrari!" Fireworks explode as Sebastian Vettel crosses the line for his third win of the season and 42nd of his career - surpassing Ayrton Senna's tally. Daniel Ricciardo finishes a season-best second, with Kimi Raikkonen third. 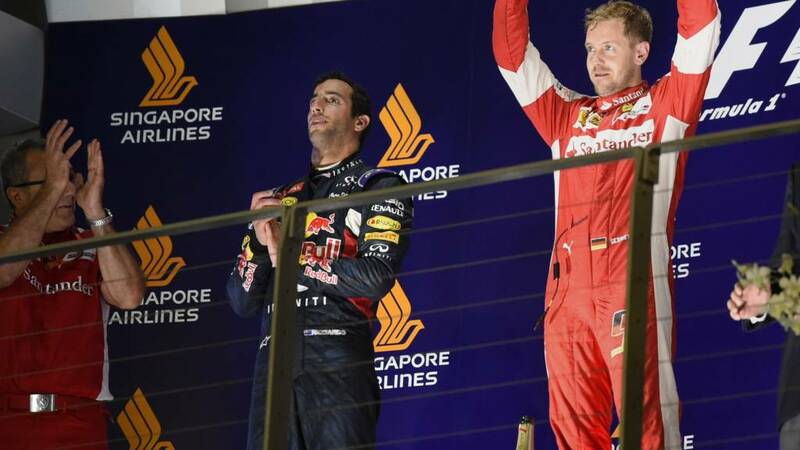 SEBASTIAN VETTEL WINS THE SINGAPORE GRAND PRIX. What will Max Verstappen do? He isn't moving yet. Max Verstappen is told he needs to swap positions with Carlos Sainz. "No!" snaps Verstappen. What will he do? Felipe Nasr nips into tenth place as Romain Grosjean locks up going into a corner. David Shelton: @McLarenF1 don't deserve the drivers they have. This is beyond ridiculous! James Morgan: Has Romain Grosjean ever not complained after being overtaken? It is looking like it is going to be third for Kimi Raikkonen as he is circulating with no-one in close proximity. Daniel Ricciardo, currently second, is nine seconds ahead, with Nico Rosberg around eight seconds behind in fourth. Engineer to Williams' Valtteri Bottas (currently fifth): "For info, there is not a lot you can do but we see a glitch in the box on downshifts." Marcus Ericsson moves past Pastor Maldonado and the latter is down to 13th. Lotus bring him in to make the switch to supersofts, which will see him through to the end of the race. Force India's Nico Hulkenberg is not happy with his three-place grid penalty in Japan for crashing into Felipa Massa. He tells BBC F1's Lee McKenzie: "No good news, that's for sure. The incident, he's coming out of the pits, the way I see it I was ahead. I was aware he was coming out of the pits but I was ahead." Here's how the top 10 looks with nine laps to go. Nico Rosberg is quietly going about his business in fourth, a podium is pretty much beyond him as he trails Kimi Raikkonen by more than six seconds. Engineer to Jenson Button: "Okay, Jenson we need to retire the car. We are taking too much risk with the gearbox." "Well, I think honestly the penalty is correct. I was inside. He just turned the car over my car - I couldn't do anything. For sure, what he did was not correct." Max Verstappen is eighth and now eyeing a move on Sergio Perez. Worth remembering that Verstappen started from the pit lane after stalling at the start. Fantastic from the teenager. Daniel Ricciardo sets a new fastest lap with a 1:50.258, chipping a couple of tenths of a second off of Sebastian Vettel's advantage. He is certainly keeping Vettel honest as we enter the closing stages of this race. Ray King: Max Verstappen gets all the plaudits but Carlos Sainz is every bit as good! Don Coyote: Let's hope Max doesn't do a Monaco. No further action is taken over the incident involving Pastor Maldonado and Jenson Button. Engineer to Lotus's Pastor Maldonado (currently 11th): "We think you have diffuser damage. You are doing a great job. Any more retirements and we can be in the points." Sebastian Vettel holds the record for the biggest winning margin, beating Fernando Alonso by 30 seconds in 2013. He won't get anywhere near that today, but is looking firmly on course for victory as his advantage over Daniel Ricciardo increases to 3.2s. Lotus's Romain Grosjean (currently 10th): "Okay, he pushed me wide. I had no place to go." Romain Grosjean has no time to ponder that move by Max Verstappen as Carlos Sainz is right behind him and he picks off the Frenchman at Turn 1, forcing the Lotus wide as he passes. "Fantastic, absolutely top-drawer driving from Verstappen. The skills he has are incredible." Brilliant from Max Verstappen. He is right behind Romain Grosjean and spies his opportunity to overtake at Turn 14, he makes his move, it looks like Grosjean holds on to it but Verstappen has another and successful gets past at Turn 16. Race control confirm that the incident between Pastor Maldonado and Jenson Button is under investigation. Meanwhile, Sebastian Vettel still leads, but his advantage is 2.6s - not quite as big as it was before the second safety car. Daniel Ricciardo is second, with Kimi Raikkonen third. Nico Rosberg is fourth but two seconds down the road from Raikkonen with 16 laps left. "Max Verstappen has just set the fastest lap of the race - a great achievement!" Max Verstappen is a born racer. He has got beyond Felipe Nasr and now he sweeps past Pastor Maldonado. He is ninth, with Carlos Sainz 10th. Both in the points and there's huge cheers from the Toro Rosso garage. Replays show that part of Jenson Button's front wing very nearly struck Carlos Sainz's helmet. A very dangerous moment. "One thing you can about Maldonado, he guarantees good TV time." "I should have known really," laments Jenson Button after that tangle with Pastor Maldonado. With the field all bunched up, Jenson Button's McLaren collides into the back of Pastor Maldonado and loses his front wing. Straight into the pits and that's a real points opportunity lost. Button is right down to the back of the pack. Sebastian Vettel slams his foot down on the accelerator and already is building up an advantage once again over Daniel Ricciardo. Twenty one laps to go and we've been racing for around one hour and 25 minutes. Will Collins: At the Singapore Grand Prix and someone has just walked along the track right in front of us during the race! Ben Wear: That is a staggeringly calm and gentle stroll that gentleman is having. Vasyl Mylko: Finally the famous Singapore poltergeist showed up visually. The safety car is still out and Sebastian Vettel is not happy with it. "Tell the safety car to speed up," he says. Nico Rosberg: "Are we going to the end?" Engineer: "You are going to end, Nico. Everyone is going to the end." Stops for Nico Rosberg, Valtteri Bottas and Jenson Button. Are we on for a fight to the flag now? "A man on the track!" Race leader Sebastian Vettel: "There is a man on the track! A man on the track!" The front three of Sebastian Vettel, Daniel Ricciardo and Kimi Raikkonen all pit, taking on softs. What on Earth!? Camera shots show someone, quite calmly strolling along the inside edge of the track as F1 cars whizz by. What is he thinking? He strolls to a gap in the fence and climbs off the circuit. There is a second safety car and there is someone on the circuit! Nick Pearman: Lewis really unlucky there. 4th place for Rosberg doesn't affect his title chances hugely though. Only reliability can stop him. Aaman Khan: Spare a thought for @LewisHamilton to be sooo close to equalling Senna's record and to be let down by his engine. Tom Howells: Do people realise that if #Vettel does win the #SingaporeGP, he actually passes #Senna's 41 race record, in 10 less races? Simon Park: Last time out the championship looked all but over, now Rosbergand maybe Vettel are right back in it. McLaren fans, don't despair though because get this: Jenson Button is now up to EIGHTH. He's had his problems today, and provided us with many a witty radio remark, but he is now looking on for some serious points in Singapore. Tom Brookes: Lewis had the chance of making this an exciting race, his inevitable retirement has killed it. Stephen: Should never have dyed his hair blonde. Let that be a lesson Lewis. Another retirement as Fernando Alonso follows Lewis Hamilton into the pits to bring an end to his race. He retires from ninth and this marks the first time Alonso has not scored points in Singapore. In contrast to Lewis Hamilton's race, it is all going perfectly for Sebastian Vettel out in front. He is now cruising along with a 4.4s advantage over Daniel Ricciardo with 34 laps gone. That is it for Lewis Hamilton. "Box, box," he is told over the radio. A first non-finish of the season for the reigning world champion. Lewis Hamilton: "Guys, we could be killing the engine here. Why don't we save it. I'm just going further and further back." Engineer: "Okay, Lewis. We are just discussing that." It is sounding increasingly likely that Lewis Hamilton is going to retire. He suggests over the radio that they should consider saving the engine as he continues to fall further back. "Hungary is the only other race Hamilton has not led so far this year." Ah bad news for Felipe Massa. He has to retire, the problem which caused him to suddenly go into neutral proving race-ending. Can Hamilton's problem be sorted? "Is it the poltergeist of Singapore catching up with a few of the cars here?" Williams' Felipe Massa (currently 11th): "I don't know what's happened - I've just gone to neutral." Lewis Hamilton's latest lap is 2:04.969 and he is now down to 10th. Meanwhile, Marcus Ericsson and Carlos Sainz head in on lap 30 for their second stops of the race, switching to supersofts. "Try HPP Driver default 01," Lewis Hamilton is told over the radio. "It doesn't work," is the reply. Plenty of code chat, there, but Hamilton is still going. Lewis Hamilton is now down to EIGHTH. What's going on? "Come on guys, how do I reset the throttle?" he asks over team radio. Meanwhile, Sebastian Vettel has turned it up at the front of the pack, he now leads Daniel Ricciardo by 3.2s. "We have got to presume there is no visible signs of problem with Hamilton's engine so it must be the recovery system." He is dropping away massively and Nico Rosberg storms past. Hamilton is hammering the buttons, trying to find a solution but nothing is working. Is he in danger of not even finishing the race!?? Lewis Hamilton reports a loss of power, he is still running but has dropped back a little bit on Kimi Raikkonen. "Quick guys, quick," says Hamilton, sounding very worried. "The brakes take a pounding in Singapore. The cars will be very marginal when we get towards the end of the race." Engineer to Jenson Button: "The car is very hot - avoid a tow where possible." A quick decision from the stewards as Nico Hulkenberg is given a three-place grid penalty for the Japanese GP. Lewis Hamilton: "Vettel's backing up Ricciardo, I think." The gap between leader Sebastian Vettel and Daniel Ricciardo is getting a little smaller, dropping to under one second on lap 22. "Rosberg's priority is to get past Hamilton to close the 53-point gap in the championship but he is under pressure from Sebastian Vettel for second place, especially with Vettel leading this race." Engineer to Lewis Hamilton (currently fourth): "Okay, Lewis, we are going to have to look after this tyre set - try to eek it out as long as we can." Lewis Hamilton will want to get on that podium, but he also needs to be mindful of Nico Rosberg, who will be desperate to score more points than his Mercedes team-mate in Singapore and chip away at Hamilton's lead in the championship. Rosberg is just over a second behind Hamilton. No surprise to see that the incident between Felipe Massa and Nico Hulkenberg is under investigation. The safety car heads in and we are back racing. Sebastian Vettel once again holds his place at the front of the pack. Daniel Ricciardo to engineer: "How is our pace?" Engineer: "We were about three or four-tenths quicker than Ferrari when we stopped. Other people nowhere close." Max Verstappen is unlapping under the safety car conditions and Lewis Hamilton has a little pop at his team, saying they should tell him when a car is coming through as he claims the Toro Rosso nearly hit him. This has worked out well for Lewis Hamilton, who is fourth and in prime position to pounce for a podium once the safety car heads in. Reports are that it is clear in Sector One, so shouldn't be too long before we are racing again. Stuart: I love F1, but I really can't see the point of having tracks where overtaking is virtually impossible, overtaking makes it exciting. Here's a picture of the incident when it happened. Now the real safety car is deployed and marshals armed with brooms head out to sweep up debris where Felipe Massa and Nico Hulkenberg collided. Engineer to Nico Rosberg: "Okay, Nico so it's looking good. We are the second car on primes. Lewis is on primes. Everyone else on options." Those towards the front of the field take the opportunity to pit, all slapping on a fresh set of supersofts except for Nico Rosberg and Lewis Hamilton, who have switched to softs. "Traditionally it's been when the two and three-stop strategies converge that we've had safety cars in this race." "I don't know what Massa could have done differently. Nico Hulkenberg would have had sight of Massa." Felipe Massa is coming out on to the circuit after his pitstop and Nico Hulkenberg slams straight into the side of the Williams, with the latter shunted into the barrier. Virtual Safety Car conditions now. Carlos Sainz is snapping and snarling on the rear of Fernando Alonso's McLaren, trying to pounce and claim P13. Alonso holds him off for now, though. Daniil Kvyat is the first of the front runners to make his first stop, pitting from fourth to take on another set of supersofts. Jenson Button reported over team radio that he was struggling with the tyres and McLaren call in Fernando Alonso to change to soft tyres. The Spaniard is not the only one to head in as Carlos Sainz follows suit soon after. Alonso is back out in 13th, with Sainz behind him. Lap 10 and we have the first of our pit stops as Romain Grosjean heads in to bolt on the soft tyres - the harder of the two compounds in Singapore. He is back out in 17th. Red Bull playing the long game? "Interestingly, Vettel was slower by three-tenths last time around than Ricciardo. Red Bull's hope this afternoon is that they can go longer on the tyres and two-stop while Ferrari have to three-stop." Malav Sutaria : Who said it is going to be cracking race..?? Vettel or Hamilton, same story at the front and no wheel to wheel racing..!! Quote Message: The rears are overheating under braking. The rears are overheating under braking. Jenson Button started in 15th, but has lost a place to Marcus Ericsson. Meanwhile, Sebastian Vettel is building his advantage at the front and is now 5.3s ahead of his former team-mate Daniel Ricciardo. Quote Message: "Lewis Hamilton team have been on the radio, telling him to maintain the gap and they will know when to pick it up. At the moment things are going to plan for him." "Lewis Hamilton team have been on the radio, telling him to maintain the gap and they will know when to pick it up. At the moment things are going to plan for him." Lewis Hamilton is currently two seconds down the road from Daniil Kvyat but the world champion is around sixth tenths of a second quicker on his latest lap. Andrew Yee: It's like a few years ago. Vettel in the lead and just pulling away. 3 seconds clear from 2nd. Wow! Hingmy: Vettel's gone Full Vettel - it's 2011 all over again. Race over? Mercedes must bide their time? "Vettel is not holding back, he is more than a second a lap quicker than Daniel Ricciardo." Just watching a replay of the start and it was smooth as silk from Sebastian Vettel. Textbook stuff. Daniel Ricciardo also got away cleanly but he just could not close down Vettel. "There will be a huge sign of relief at Ferrari - two weeks ago Kimi Raikkonen went from second on the grid to last at the first corner." One lap down in the 61-lap race and Sebastian Vettel leads ahead of Daniel Ricciardo, Kimi Raikkonen, Daniil Kvyat and then Lewis Hamilton. Vettel's lead over Ricciardo is already up to three seconds. A fourth win in Singapore is very much on the cards for the Ferrari man. Disaster for young Max Verstappen. His Toro Rosso stalls at the start and is currently being pushed along by the marshals. Sebastian Vettel holds his place at the front going into the first corner. Both Mercedes get away OK but make no gains and Lewis Hamilton and Nico Rosberg remain fifth and sixth respectively. "Mercedes were saying yesterday there is nothing wrong with the balance of their car yesterday - it was about tyre temperature. "They are expecting to be more competitive in the race today but they're not expecting to challenge Ferrari at the front." Supersoft is the tyre of choice for the entire field. The cars are just lining up in their places on the grid. "Sebastian Vettel has been in the top two of the last five grands prix here. A stunning lap in qualifying." Interesting from Jennie. Are we going to see problems for Mercedes at the start? They both get away OK for the formation lap as Sebastian Vettel leads the grid away. Problems for Hamilton & Rosberg already!? Felipe Nasr hydrates before a long race where dehydration will be a factor. It is now pitch black at Singapore bar the bright lights of the circuit and the skyscrapers. Can't see whether there are any clouds, but there's apparently a 10% chance of rain at some point during the race. “The F1 ‘silly season’ is in full swing in Singapore this weekend. Eddie Jordan has comprehensively run through the engine merry-go-round for us, but what about drivers? Well, that focuses on the Lotus (soon to be Renault, we believe), Force India and new Haas teams, with Romain Grosjean at the centre of it. “The Franco-Swiss is under contract to Lotus/Renault and in theory should be a certainty there given his and Renault’s nationalities. But he is said to have itchy feet and fancies a move to Haas because they have close links with Ferrari and he has his eyes on Kimi Raikkonen’s Ferrari seat in 2017. If Grosjean doesn’t move, McLaren reserve driver Kevin Magnussen is the favourite for the Haas seat alongside either Esteban Gutierrez or Jean-Eric Vergne (Haas have said they want one Ferrari reserve driver). Zaki Mangalji: Soda, crisps and the #SingaporeGP. Bring it home Seb. Trisha and Matt: Hopefully Lewis can still score some good points still. LH44 Pogba: Any surprises from @MercedesAMGF1 for todays race? We've just had the Singapore national anthem, sung A capella. Now the teams and drivers are going through their last few bits of preparations, with 10 minutes until lights out. Alexander Rossi (20th on the grid for Manor) is the first American to start an F1 race since Scott Speed in 2007. Engineer on team radio: "Kimi reports the car is much better than yesterday, the rear feels more stable"
Also, take a look at some of the quirky statistics behind one of F1's most iconic races in our preview here. "As predicted by most of the teams and drivers ahead, it’s tight behind the big three teams, with only 0.4secs covering seventh to ninth, Williams drivers Valtteri Bottas and Felipe Massa sandwiching the Toro Rosso of the ever-impressive Max Verstappen in eighth. The Dutchman’s team-mate Carlos Sainz has been very close to him all weekend, arguably actually having the edge, but a brush with the wall in Q2 put paid to his chances of being in the top 10, too. Toro Rosso's Max Verstappen has a best finish of fourth at Hungary. Starting eighth on the grid, he could challenge for significant points today. The Singapore Grand Prix is one of the longest races of the season - with no previous race finishing in under one hour 56 minutes. That, as well as the number of corners, bumpy nature of the circuit and the heat and humidity, makes it one of the most challenging tracks for the drivers. How often will we see the safety car? Safety car to play its part? History would suggest that we'll see the safety car at some point today. It has appeared in every single race in Singapore since the inaugural one in 2008. Colin Davies-Watts: Don't hear Red Bull moaning about their engine today. James Weir: Could Rosberg be in trouble for the second year in a row in Singapore? Problems at the pit exit. Nico Rosberg manages to get himself going and onto the circuit after that little bit of pre-race drama. "My mistake," comes another message from Nico Rosberg. "Was it your mistake Nico," he is asked. "Affirm." An issue already for Nico Rosberg? He is in the pit lane, but is going nowhere. "My engine has gone off, come and get me," he says over team radio. The cars are heading to the grid... less than 30 minutes to go. “McLaren did not deliver on their ambition of making the top 10 in qualifying. But while Jenson Button understandably sounded a bit fed up - down in 15th, struggling with balance and 0.7 seconds and three places behind team-mate Fernando Alonso, who has looked on a separate level all weekend - Alonso was anything but. “To be fair, Alonso has said from the beginning of the weekend that he thought top 10 on the grid was optimistic - but he is firm in his desire to be in the points in the race. Points in store for McLaren? "It's going to be interesting for us. We have the possibility to get some points at this type of circuit and we want to take this opportunity. "It's very tough here, mechanically and physically"
"I am looking forward to seeing what happens at the front and we have the action in the middle of the pack. "It's unforgiving here and it makes racing and overtaking difficult. There is normally some action - bumping and bits falling off cars." Speaking of Lewis Hamilton's lead, here's a look at the standings. Hamilton heads into the race with a healthy 53 point lead over Nico Rosberg, who will be starting to look over his shoulder. Sebastian Vettel is just 21 points and is in prime position to close the gap from the front row today. The Sunday Mirror warn that 'only the misguided would totally write off a driver of Hamilton's calibre beating the odds as he has done so often in the past', adding: 'Ultimately what is most important is extending his massive 53-point lead in the title race over Mercedes team-mate Nico Rosberg'. The Observer describes Vettel's pole as 'one of the greatest party poops in Formula 1 history' and claim 'the most alarming fact was the size of the gap between Mercedes and the leaders'. The Sunday Telegraph is not afraid of hyperbole, claiming Vetel's pole was 'the most astonishing upset these parts have witnessed since Japanese soldiers overwhelmed the British occupation of Singapore in 1942'. They report Mercedes' boss Toto Wolff's denials that their lack of pace is due to previously 'running illegal tyre pressures' until Hamilton was nearly disqualified after the Italian Grand Prix 'for such an infringement'. The Sunday Times says that Ferrari's Sebastian Vettel has 'spoilt the planned record-equalling celebrations of Mercedes and Lewis Hamilton' by preventing him from matching Ayrton Senna's tally of eight consecutive pole positions. They add that a Mercedes pole would have made it 24 in succession for the team - 'which would have equalled the record of Williams from 1992 to 1993'. “Half a second up the road Sebastian Vettel may be in qualifying, but that does not necessarily mean he will walk away with the race. Quote Message: Sebastian Vettel appears to be at his brilliant best. If he can get the first corner, it will be incredibly difficult to beat him. Sebastian Vettel appears to be at his brilliant best. If he can get the first corner, it will be incredibly difficult to beat him. “Sebastian Vettel has taken a lot of pole positions in his remarkably successful grand prix career so far but the 46th surely has to be one of the best. "He has looked on fire throughout the weekend and his pole lap was a stunner, all the more so because he did not actually need to do it. His first flying lap was good enough for him to have had pole in his pocket by 0.123 seconds by the time everyone else had finished their runs. At that stage, Vettel still had half his final lap to go, but he kept his foot in for the sheer joy of it, and the result was pole by more than half a second. No-one is more successful in Singapore than Sebastian Vettel. The German has won more races than any other driver, winning three in a row from 2011. Not exactly something the rest of the field will want to read. Quote Message: Daniel Ricciardo had those breakthrough wins last season. He has lots of energy and enthusiasm. Red Bull have been saving up for this weekend knowing it would be a chance for a podium. Expect some action on the run down to the first corner. Daniel Ricciardo had those breakthrough wins last season. He has lots of energy and enthusiasm. Red Bull have been saving up for this weekend knowing it would be a chance for a podium. Expect some action on the run down to the first corner. "I should have a clear run into turn one so it should be fun. "It's quite a bit cooler tonight which might be physically a bit easier for the other drivers. "Everyone is going to try to make it a two-stop work." There was plenty of talk in the build up to this race about Lewis Hamilton and the chance he has to equal Ayrton Senna's record of 41 wins from 161 starts. Quote Message: Lewis Hamilton is having a great season. He knows that as long as he is performing at the best of his ability then what more can he do? There is a large amount of head scratching at Mercedes as to why, when they have made these tyres work perfectly well in the last two years, is it not working here? Lewis Hamilton is having a great season. He knows that as long as he is performing at the best of his ability then what more can he do? There is a large amount of head scratching at Mercedes as to why, when they have made these tyres work perfectly well in the last two years, is it not working here? "It's going to be very tough, for sure, but we are going to give it our best shot. "It's a little bit cooler today which might help with the tyres but we have not figured anything out with them. "I am fighting for the win - I am going to give it hell."